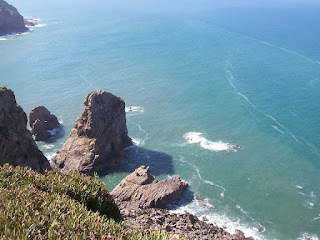 As I mentioned earlier, I'm hijacking this blog to report on my impressions from our travel in Portugal. Book review posts will continue as scheduled, this is just something a little extra. We arrived at the Lisbon airport around 8 am, very fatigued and jet-lagged, and after following the crowd through the long long terminal to where we needed to present our passports to gain entry into the country, found ourselves in a Disneyland style loopback queue for a little over an hour, inching slowing forward. My wife, M, struck up a conversation with a lady from Brazil in the line behind us, and though they had very little language in common, just a smattering of English and Spanish (Brazilians speak Portuguese), they managed to share photos of their children, and discuss the daughter of a fellow Brazilian in the group who is a doctor in Canada now. The very polite passport officials finally stamped our passports without question or comment, and we were now free to move about the country. We continued following arrows and signs saying "Salida" until we found ourselves in the public area, where our Portuguese son, Manny, saw us and ran to greet us. We had been a little worried that he might give up on us, as the passport delay had put us a bit behind on our arrival time, but he perservered. Ok, so my major first (not discouraged so far) impression of Portugal is that the drivers here are insane, and their auto traffic is utter chaos. There seem to be few rules, unless the police are handy, except to get wherever you're going in the quickest, shortest possible way. Manny drove us east from Lisbon to Cascais, and on a short sightseeing trip up the coast through a beach area called the Guincha, very popular with surfers, kite boarders and both locals and tourist, up to a place called Cabo da Roca. As fate would have it, we arrived in the middle of a rather large motorcycle rally, and very nearly got Manny's car boxed in in the parking lot. I was surprised to see the distribution of bike types; I had expected the European models, but there were just as many Japanese bikes on the road here as at home, including one very conspicuous Honda Goldwing. Eventually, we returned to Cascais, and met with Manny's parents, Manuel and Irene, and his brother Robert, at their house in town. Manuel owns a small neighborhood grocery store, and their house is in a fairly modern residential district about five minutes from the beach. Manuel prepared a traditional Madeiran lunch of brai, a seasoned skewered dish of beef prepared over charcoal, and some chorizo (can't recall the Portuguese spelling), with a fresh salad and baked new potatos, and we all settled in for a nice lunch and some conversation. It was fascinating to find out how much we all had in common, even on such short acquaintance. On topics ranging from parenting to health care to the problem of how to be compassionate towards the poor, yet wary of beggars' scams, it really is a small world. Manny and Robert crashed out after lunch, but the four "adults" climbed into the car and went on an excursion. 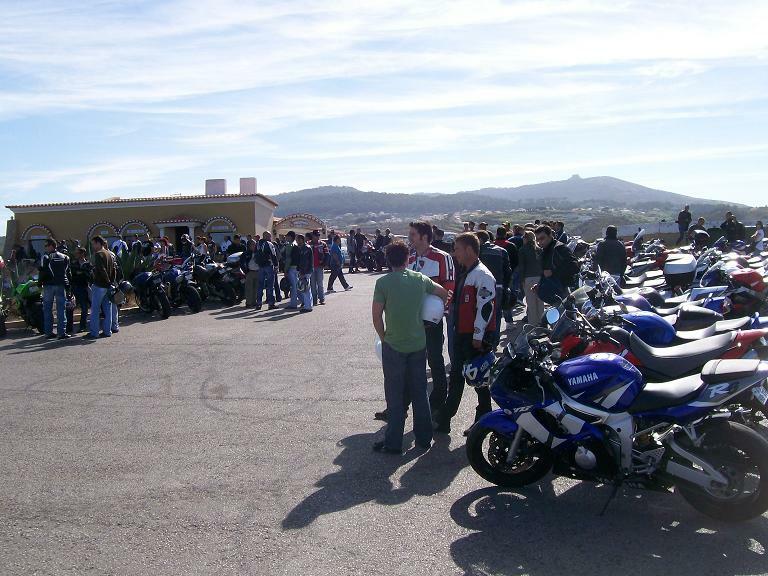 We saw the track in town in Sintra where they hold World Superbike events, and snuck around to a vantage point on the backside of the track to peek at what was going on. It turned out to be car races, so I snuck a quick photo and we moved on. We headed first into downtown old centra Sintra, where there is a great park by a small lake which is frequented by gypsy markets and street buskers of all types, including these folks who would definitely fit in with my SCA friends back home. 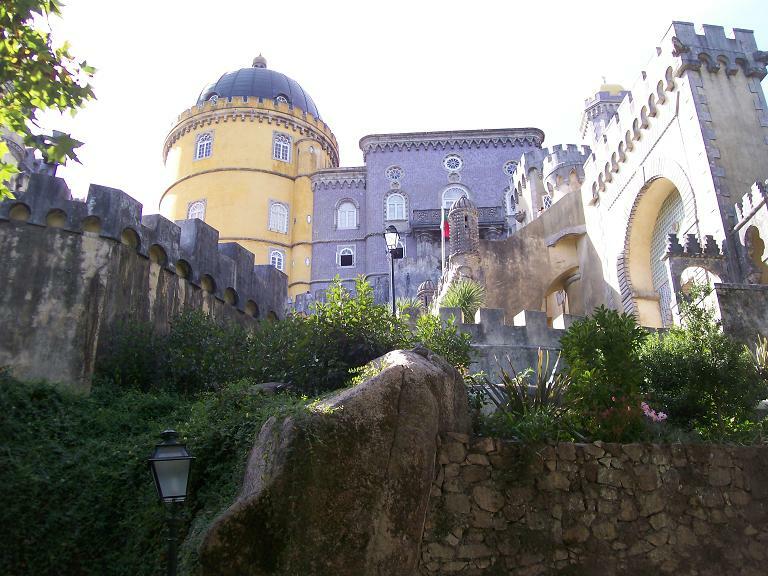 After driving through narrow stone-paved (not cobbles) streets for a while, we began to wind up the hill to the Park and Palace of Pena. The first thing I commented on was the steepness of the terrain, and that anyone who wished to storm the castle would have a very rough time building up any momentum whatsoever getting their army up there in the first place. Probably a 50-60 degree slope all the way, and extremely rocky and forested. People wander all through this wooded area, hiking, taking photos, and communing with nature. 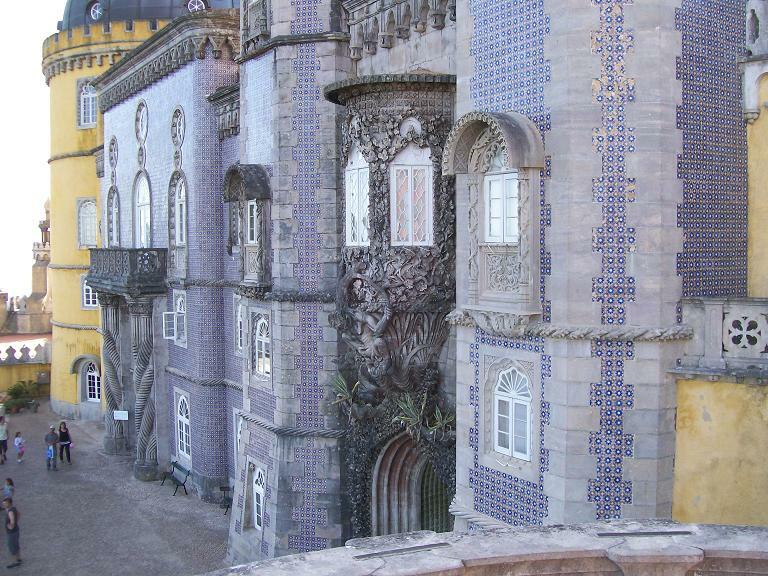 The main attraction when you get to the top, however, is the Palacio da Pena, an example of nineteenth century Portuguese Romanticism in its architecture. We spent a few hours traipsing through its many rooms and grounds, and it was just astonishing. They don't allow any photography on the inside, probably in order to sell more post cards at the gift shop, but it's really quite overwhelming. 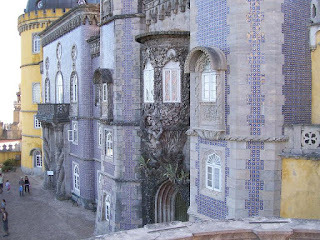 Each room and courtyard has its own unique design, from the decorative ceilings, many of which are trompe l'oiel, to detailed woodwork, marble sculpture, and fanciful stone gargoyles. My Idaho hunting buddies would have been amazed by the antler racks on display in the Stag Room. I took far too many pictures to post here, but if you gotta pick a first castle to visit in your lifetime, you wouldn't do badly by starting here. 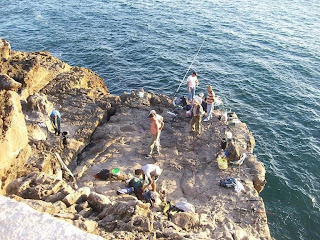 Around closing time, we made our way back down the hill again, and drove down the coast to the Guincha beach area again, where we went for a little walk and took a picture of the kite boarders, who were enjoying the gusty winds of the Atlantic Coast. 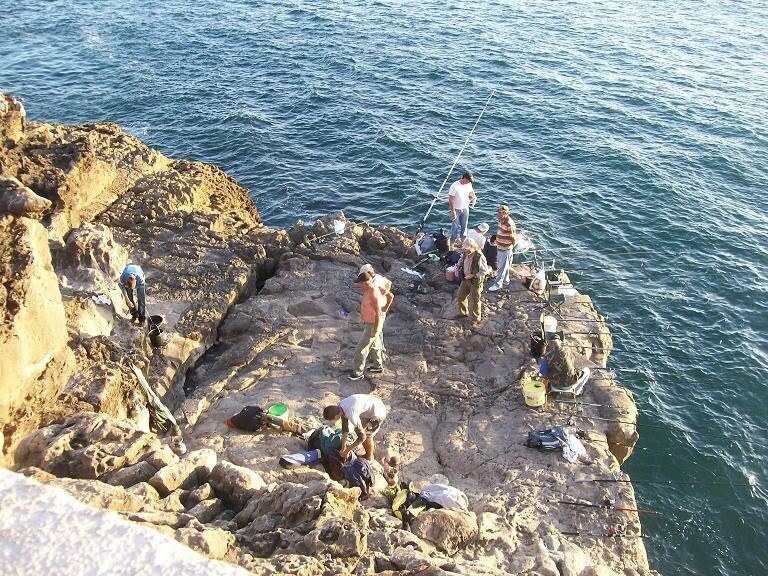 Then we drove a little further down the coast to Boca de Inferno, a popular spot where the steep cliffs have collapsed into an archway, and where tourists and locals gather to look at the view, photograph one another, and do a bit of fishing (the guys on the left are brewing up a bucket of chum). We stopped at a little cafe and enjoyed some strong coffee with milk and sugar, and some locally made sweet biscuits, chatting for a couple hours, watching the sun set over the water, before returning just after dark to Manuel and Irene's house for a late snack of must-gos and some delicious white melon. More tomorrow, after another day's travels. Sounds amazing so far. Are you going to try kiteboarding?